The Drums and percussion can always be adjusted to suit the genre of music. For example, several Classical pieces may be played with the pans alone, without percussion. However, percussion will definitely be required for Caribbean music such as Calypso and Reggae. There are several vendors that sell pans in sufficient quantity to allow you to form your band. The prices may vary according to the quality of instruments and you will have to be very careful when buying. Please see the Buying Guide for help in assessing the steel pans. You should site the steel band shed in a location that allows easy access by a truck. This will save you from the headache of having to carry the instruments over a long distance when packing your truck. It is also important to ensure that the steel pans and other instruments are properly sheltered from the elements. There should be enough space to allow players to play without feeling space restricted and they should be able to move freely between the various rows of steel pans without knocking the instruments over. In addition, the height of the ceiling should ideally be a minimum of 16 to 20 feet high in order to achieve maximum clarity of the sound of the band. A ceiling that is too low may cause undesirable reflections of sound that make the band noisy. You would want to avoid discovering this problem after you have built the pan shed ( as it is commonly called by steel pan players) as it may be fairly expensive to rectify. The pan shed should also have built-in racks upon which the smaller frontline and the middle pans can be placed. However, if your instruments are usually placed in cases, they may be stored in some other safe location in the pan shed. Just be sure that the location will not allow the steel pans to suffer damage or become wet, and provides shelter from direct sunlight. Proper storage will also be necessary for the percussion and drum kit. Remember, your instruments are expensive and should be treated as such. You should also see Care of Steel Drums for further tips. With proper care, the instruments will give many years of service long after starting a steel band. Even before you start your band, membership should be considered. If the purpose of your band will be to provide an avenue for kids to learn a new skill, then you will need to seek ways of attracting them to the band. One approach is to inform the administration of a nearby community school that you intend to start a steel band and are interested in their students becoming members. Another way would be to hold a steel pan workshop for youngsters. A number of them may then develop an interest in steel pan and join your steel band. 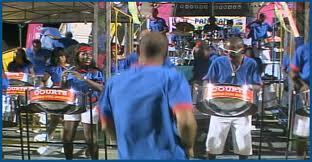 If your band will be a combo, you will need fewer and more experienced steel pan players, as you may be intending to play musical engagements in the near future. Forming a band for this purpose will necessitate that you publicly advertise a request for professional players. After starting a steel band you will require a repertoire. Most music can be played on steel drums with some adaptation. This includes Classical, Jazz, Calypso, Reggae, Latin and many others. If you wish to start a steel band but cannot prepare your own music arrangements, there are several sites that sell music charts for steel band. Ideally, you should attempt to prepare your own music arrangements in order to save money. Please see Playing Basics for information on how to play chords on steel pan. Also see the Types of steel Drums for the role of the various steel pans as far as a steel band arrangement is concerned. You should also listen to steel band music arrangements on You Tube, or buy a few steel band CD’s for listening. Your instruments are fragile and should be carefully transported to and from the performance location. This will save you the expense of frequent tuning and repairs. The steel pans should be covered to prevent exposure to the elements and firmly packed together in order to minimize movement during travel. Finally, it is good practice to return instruments to their proper locations in the pan shed to prevent clutter and the risk of stepping on the instruments.